Ursula K. Le Guin’s beautiful, haunting new novel, due out in the UK in May 2009, has already been published in America. Accordingly, the bound proof I read came pre-endorsed for the Britreader: “a winning combination of history and mythology featuring an unlikely heroine imaginatively plucked from literary obscurity” (Booklist). That rather undersells it, actually. “Deserves to be ranked with Robert Graves’s I Claudius” (Publishers Weekly). That’s more like it. Although Le Guin’s pre-Roman first person narrative has a very different flavour to Graves’s Imperial Roman first person narrative, they are of a similar stature: classics in essence as well as theme. “Arguably her best novel” (Kirkus). Arguably so. Certainly I enjoyed this novel more than any Le Guin since the 1970s; and that (it’s almost tautological to add this) means that I enjoyed it more than pretty much any novel since the 1970s. It possesses a depth, clarity and wonder greater than most of the fiction being published nowadays. Other reviews: Charlotte Higgins in The Guardian, Tobias Hill in The Observer, Cecelia Holland in Locus, John Garth in The Telegraph. See also a four-part discussion of Lavinia started here last year, and continued here, here, and here, with follow-ups here and here. I love it too, but it’s fantasy. That’s certainly my feeling, but well, here it is. What interests me, actually, is not the nominators who clearly see no distinction between sf and fantasy, but those who do see a difference, and included Lavinia anyway. Several people even said things like, “I’d love to be able to nominate Jonathan Strange & Mr Norrell, but it’s fantasy…” and then cheerfully nominated Le Guin. I’m quite certain it’s one of the best novels of the decade, though. *cough* Move along, nothing to see here. Oh. Like Chance, I thought the first version made it sound more interesting! If you thought *I* was effusive, you should have seen what my husband said about this novel! I’m with Jo Walton: I *really* liked Lavinia, but I definitely see it as fantasy, and therefore didn’t vote for it in this poll. Several people even said things like, “I’d love to be able to nominate Jonathan Strange & Mr Norrell, but it’s fantasy…” and then cheerfully nominated Le Guin. Interesting. I wonder if that’s exactly what happened in some cases–if people voted for Le Guin, based on her identity as a writer of SF. (It certainly felt odd to me to not include her in a list of a recent decade’s best SF, nevermind one by women writers.) 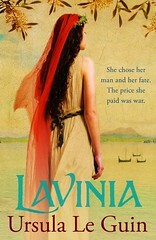 Or is there interesting insight to be gained by applying an SF perspective to Lavinia? Or maybe it was just considered so great a book that it deserved to be brought into any adjacent list of great books. I thought about it myself, but like other commenters decided it was too solidly fantasy. I thought harder about Le Guin’s Changing Planes (2003), which while not as good does make slightly more of a gesture at being SF–although less at being a novel, which, combined with the fact that several of its stories were published in previous decades, ended up nixing it for me. I wasn’t drawing a distinction, which is why I voted for Lavinia, and for Bold As Love – I view that sequence as fantasy set in the future rather than sf. I probably would have voted for Clarke as well, had I ever managed to finish it (another novel I started but then had to move on to something else and never got back to). The thing is that women are writing and publishing plenty of fantasy, and not all that much SF. That is the whole point. Redefining fantasy as SF “because it’s good” or “because I don’t make a distinction” makes the whole exercise pointless. If you ask me what the “ten best novels by women in this decade” were, I’m going to give you a really different answer from the “ten best science fiction novels by women”. If fantasy si SF then up is down and you might as well say that _Anathem_ ought to be on the list. It’s by a man, but it’s one of the ten best books, and I’m choosing not to make that distinction. Thanks, Shana, I’ll add that to tomorrow’s link round-up. I couldn’t agree more. Doesn’t it negate the idea that this list was put together to honor and promote great science fiction written by women? Having witnessed some of the intense, often vitriolic, back and forth about women in genre fiction getting their due over the last few years, this seems to be the kind of thing to set it off again. And maybe that isn’t a bad thing, but I think a list like this that will immediately attract a certain element that would dismiss the list, and the writers on it, because “they don’t even know the difference between science fiction and fantasy”.